Going to Lisbon? Love food? 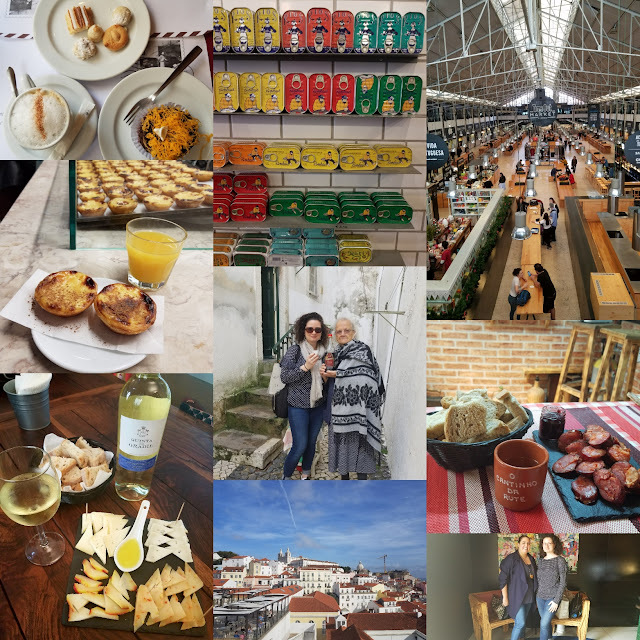 Looking for a fun way to spend 4 hours, learn about food and history of Portugal, and get hundreds of steps in? Then you need to sign up for one of the tours offered by Lazy Flavors. One of the first things I did after booking airline tickets and hotel for a solo vacation in Lisbon for Thanksgiving, was finding a food tour. I found Mariana, the owner of Lazy Flavors, through one of my sister's friends and contacted her to see if I could join one of the tours. Because of the schedule conflicts, I could not join a group tour, but Mariana offered a one on one tour and was gracious to host me in exchange for an honest review on my blog. I highly recommend arranging a food tour of any destination you are visiting as close to the beginning of the trip as possible. That way you'll get a great understanding of the city, find areas you'd like to explore further, and meet a local. Mariana customized the tour for me when I mentioned that I wanted to visit one of the markets, and was very quick to respond by email to multiple questions I had. Mariana picked me up at my hotel and we went next door to Confeitaria Nacional established in 1829! There, over pastries and coffee, Mariana told me that Portuguese sweets are commonly made with eggs and almonds. This particular bakery is known for their King's Cake that many residents buy for Christmas after standing in line that wraps around the block. Over the next 4 hours we visited Time Out Market, went on a tuk tuk ride to the neighborhood of Alfama (my favorite) where I tried fire roasted chorizo and ginginha (sour cherry liquor) sold by an old lady, then made our way back into central Lisbon for a cheese tasting, and a stop at a store that only sells tinned fish. Time Out Market is a great place to visit whether you are staying in a hotel or an airbnb. Part of the market is devoted to produce, fresh fish, flowers, and other ingredients you can pick up to bring back to your airbnb and turn into a meal. The other part is prepared food, restaurants, and kiosks where you can buy food to eat right there. That's where I tried Lisbon's famous egg tarts at a Manteigaria. Every time the tarts come out of the oven, the little cafe rings the bell! I returned to the market one other time during my trip for fresh oysters. At the cheese store where we had our cheese tasting, with a very large glass of wine, I learned that most of the cheeses in Portugal are made from sheep or goat milk. Queijaria Nacional is a great place to pop into in between wondering around the city for a quick bite. The service, food, and decor were outstanding. Before dropping me off at my hotel, Mariana bought a bag of roasted chestnuts: this was the first time I've ever tried them. Lisbon's sidewalks were filled with people roasting chestnuts on little carts. The chestnuts were hot, dense, and filling! The aroma was the best part. Thank you Mariana for a wonderful tour of the city. I'll be sure to sign up for one of the cooking classes if I'll come back to Lisbon. Stay tuned for another blog post about all the other things I did in Lisbon. I had the best time and am excited to share all my experiences with you to help you plan your trip!